Canntrust Holdings: Are The Lows In? 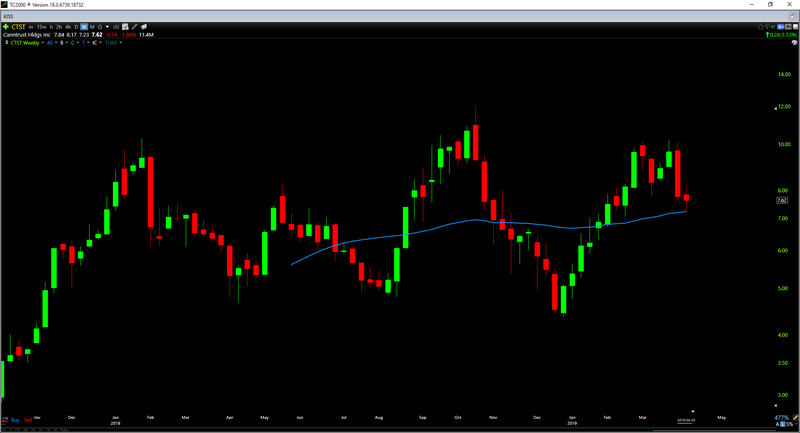 Canntrust is down nearly 30% from its most recent highs and has come down to test its 40-week moving average. The company recently listed on the NYSE, and is expected to move to profitability in FY-2019. As long as the stock can hold the $7.10 level, it's possible the stock is building out a handle in a larger saucer base. Canntrust Holdings (CTST) released its FY-2018 results last month, and the stock was punished for missing revenues estimates for Q4. Analysts were expecting revenues of roughly $21.0, but the company came in very light at $16.2 million. The stock has since taken a nose dive and has fallen nearly 30% over the past two weeks. While this is likely not the reaction most bulls were expecting, the good news is that the chart isn't broken just yet. This plunge in the stock has left Canntrust sitting right near its 40-week moving average, a crucial level for the bulls to develop going forward to prevent a deeper pullback. 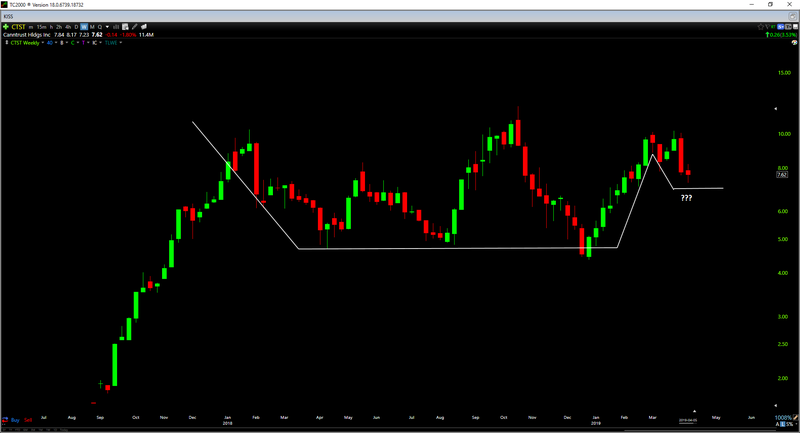 As long as the bulls can defend the $7.05 level, it's possible that the lows might be in here for this pullback. Canntrust is the newest name to list on the NYSE Market but is off to a rocky start short-term with the most recent drop following earnings. While revenues more than doubled year-over-year, the more than 20% miss is significant, and the stock was punished accordingly. Two areas where it would be ideal for seeing improvement in coming quarters are the erosion in gross margins we saw last quarter down from 63% in FY-2017 down to 57% in FY-2018, as well as average revenue per gram equivalent of extract sales dropping from $9.39 to $5.76 year-over-year. Overall, I would say the quarter was mixed at best, but 2019 will be pivotal to see if the company can deliver on efficiencies as they move into Phase 2 and Phase 3 construction going forward. When a company is priced for perfection going into an earnings report as Canntrust was, a report like this is not going to sit well with the market, and this is why I believe a good chunk of the drop was justified. 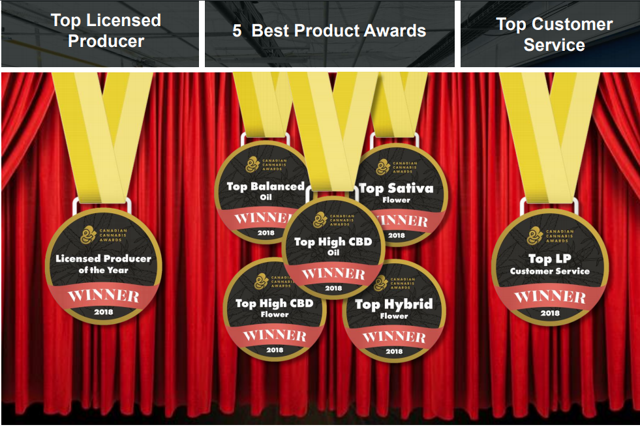 On the positive side, Canntrust managed to grow their patients by 57% year-over-year to a total of more than 58,000 active Canadian patients and was the recipient of several awards including Licensed Producer of the Year, Top Sativa Flower, and Top High CBD oil. In addition to this, cash costs decreased substantially from over $5.00 per gram to $2.94 per gram on a year-over-year basis. The company also secured several key partnerships with companies like Greywolf Animal Health, Breakthru Beverage Group, and National Access Cannabis, and there is undoubted upside if they can deliver in these areas. Taking a look at a chart of the revenue trend I've built below, we can see that revenues continue to grow at a steady pace, and there's no damage done to this trend despite Q4 2018 coming in quite light. 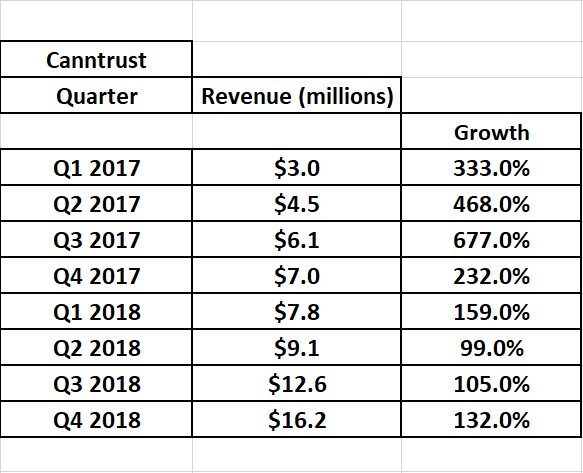 There's no question that Q4's 132% revenue growth pales considerably to the 338% growth posted in the same quarter by Cronos (OTC:CRON) and 350% by Canopy Growth (OTC:CGC), but I wouldn't write off Canntrust just yet based on one quarter of revenue growth. Revenue growth is expected to come in at $13.6 million for Q1 2019 based on analyst estimates which would represent 74% growth vs. the $7.8 million reported in the Q1 2018 quarter, and it will be imperative that the company at least meet, if not beat these estimates. I say this because funds will generally flock towards the leader in the group with the highest growth, and Canntrust's revenue growth is placing it near the bottom of the pack currently even if it is priced at a lower multiple. Moving over to annual earnings per share [EPS], we can see that Canntrust went from profitability in FY-2017 to a net loss in FY-2018, but fortunately, this trend is not expected to continue. As we can see from the chart I've built of annual earnings per share below, FY-2019 should see the company's annual EPS break out of the current range between (-) $0.15 and (+) $0.07, and put in a new all-time high. Therefore, the next couple of quarters will be pivotal for the company as this would place Canntrust as one of the first companies to see earnings per share hit an all-time high for FY-2019. I say this because other NYSE-listed peers are not expected to see profitability for FY-2019 based on estimates (Cronos, Aurora, Canopy Growth all expect to see a net loss in FY-2019). Based on the above trend in revenue growth and the earnings trend that has the potential to break out to a new all-time high in FY-2019, things are looking positive from a growth standpoint. While there's no question that peers have much more attractive revenue growth, the next couple quarters will be necessary to see if Canntrust can close the gap a little more with peers in terms of their top-line. The stock is now priced more attractively compared to when it headed into the earnings report when it was priced closer to perfection, so it's up to the bulls to play some defense technically now. Why is it important for the bulls to play defense here? Let's take a look at the below technical picture. As we can see from the above weekly chart of the Canntrust, the stock has come down to test its 40-week moving average (blue line). This is the line in the sand in terms of the intermediate trend, and I would not want to see a weekly close below this area which currently sits just above $7.00. As we can see, all past corrections sliced through the 40-week moving average like it wasn't even there. It would be positive if the bulls can play defense here this time around and prove we're seeing a slight change of character in the stock. For now, the jury is out on what will occur. Taking another look at the weekly chart, we can see that a saucer type base is building over the past year and a half. If the bulls can play defense at the $7.05 level, the stock has a potential to form a handle to this base still, and a higher low on the weekly chart. Given that the stock is nearing oversold levels here, there is indeed the potential for this, and that would be a positive development for the bulls. Any drop below the $7.05 level is going to making the higher low thesis here much less likely as it will dent the structure of the current chart pattern. 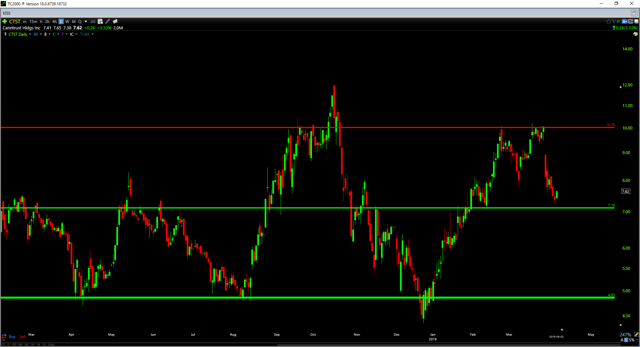 Finally, moving to a daily chart, we can see that crucial support sits at $7.05, with strong support at $4.85 below. As long as the bulls can defend $7.05, I see no reason to entertain a drop down to monthly support near the $4.85 level. However, a break below $7.05 would be a negative development and open up the possibility for a drop down to these levels. On the resistance front, the stock has a brick wall of resistance at $10.00, and the bulls are going to want to break through this level on a weekly close to get the bullish momentum back on their side across all time-frames. While many investors are likely frustrated with their Canntrust stock over the past couple weeks after sitting through a 30% drop, the potential still exists for a handle to the current saucer base on the weekly chart. The stock is nearing oversold levels currently, and there is a decent likelihood this higher low thesis can hold, but it's up to the bulls to play defense at $7.05 where they have to. 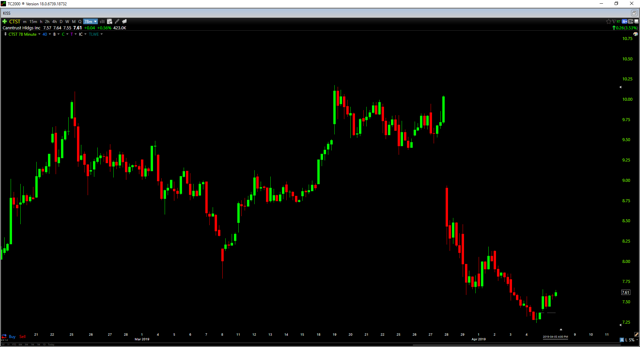 I continue to monitor the stock for a low-risk entry, but do not have any position currently. If I were holding the name, I would want to see the $7.05 level defended.